In this activity students work as a team to determine the effect salt has on plant germination. They then use their lab data to create a report on how the increasing salt concentrations affected the germination of the seeds and at what salt concentration no seeds will germinate. 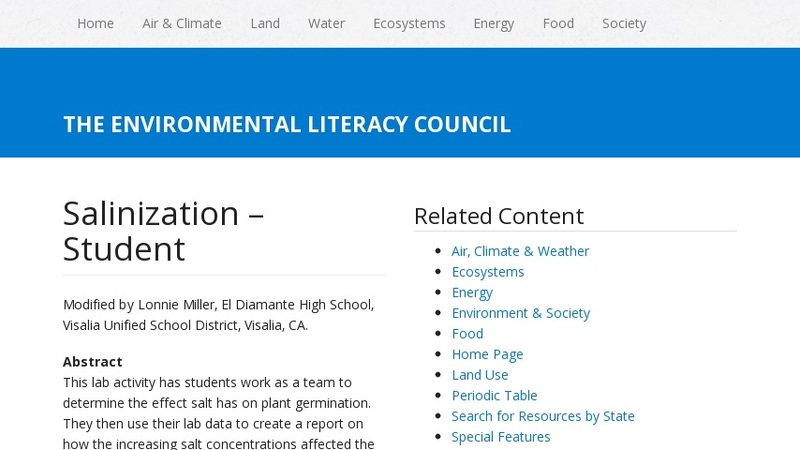 Students will discover that salt buildup is an existing or potential hazard on almost all of the 42 million acres of irrigated farmland in the United States. Much of the world's unused land is in arid and semiarid regions where irrigation will be necessary. Water contains a small amount of salt and over time this salt accumulates in the soil. This activity has an accompanying teacher site with hints and more information.